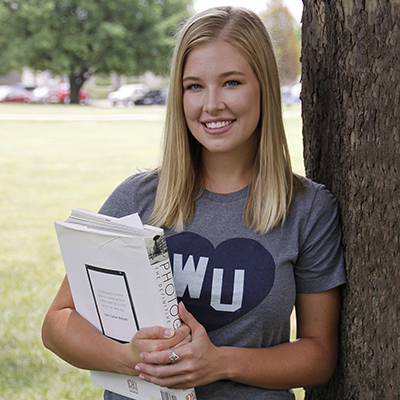 The sorority community is a great place to get involved at Washburn. Register for the Formal Sorority Recruitment process today. The Washburn fraternity and sorority community fosters the development of advanced leaders. Each Greek chapter is a self-governing organization that allows its members to hold leadership positions, which support the positive growth within the chapter. The Washburn Greek community also challenges its members to become actively involved with faculty and staff, student organizations and clubs, athletics, and internship opportunities. At Washburn 85% of our Greek community is involved in an organization outside of their fraternity or sorority. The development of these leadership skills is an important part of your education that helps prepare you for a successful career and personal life. The Greek community strongly supports the value of academics and the importance of a quality education. One of the primary goals of the fraternity and sorority community is to encourage and develop high academic achievement among its members. As a result the Washburn Greek community continually achieves higher than the all campus grade point average. Each chapter in our fraternity and sorority community supports the academic development of its members through peer tutoring, study and academic programming, and academic advising. Academic scholarships are also available through many of our chapters. This is a value that is truly important to the Washburn Greek community. Each fraternity or sorority at Washburn focuses on a specific philanthropy and/or community service to support either locally or nationally. The time spent helping others in need through community work, fundraising, awareness, and education allows members to personally grow as individuals and promotes the bond within a chapter and our community. The Washburn Greek community on average raises over $10,000 dollars and completes over 6,000 hours annually. The principal of brotherhood and sisterhood is the foundation upon which each fraternity and sorority is built. This loyalty and friendship can help make your transition to college life a little easier, more enjoyable, and certainly more fun. The Washburn fraternity and sorority community focuses on the idea of community working together on many of the service projects, educational programming, and recruitment. Not only will you build the bonds of brotherhood/sisterhood within your own chapter, but you will build bonds of friendship with the entire Washburn Greek community. Together with leadership and academic development, participation in the Greek community helps create a network of mentors that will help you through your college years and professional career. Using the resources of the fraternity and sorority alumni, you’ll find support when you are looking for that new position or applying for graduate school. Within the Washburn fraternity and sorority community you will have opportunities to learn the importance of social skills that are needed to succeed in today’s global world. Throughout the year a fraternity or sorority member may participate in many sponsored social events that emphasize community service, academics or just meeting new friends. The Greek community is also involved in major university events that are open to all students like the Washburn Lecture Series, Homecoming, athletic events, Greek Week and even events sponsored through each chapter like backyard barbeques, Sonic runs, dances, and spring formals. Each fraternity and sorority has members who participate in a variety of the Washburn Athletic teams, as well as, participation in the intramurals program through the SRWC. These sponsored activities support the value of wellness, encourages healthy competition, and inspires team spirit, establishes extended friendships, and is fun for all involved.